Hello Stampers! I've been working hard to get ready for my New Catalog Open House. It's coming up faster than I've hoped it to be but I'm super excited about the New Catalog!!! Can't wait to show you what I've got for you at my Open House! 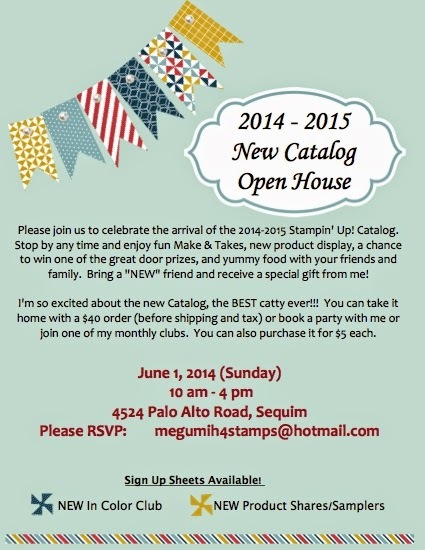 If you are in the Sequim (Olympic Peninsula) area in Washington, please join us for a fun day of stamping and socializing with your friends and family. Please RSVP by Saturday, May 31st so that I can prepare your Make & Take kit in advance. A special thank-you to all of my Monthly Card Club members for your continued support! I appreciate all of you coming to my studio every month to share my passion of paper-crafting. I hope to see you many of you at my Open House but if you are not able to make it, please contact me by Sunday to take advantage of my Club Member exclusive offer.